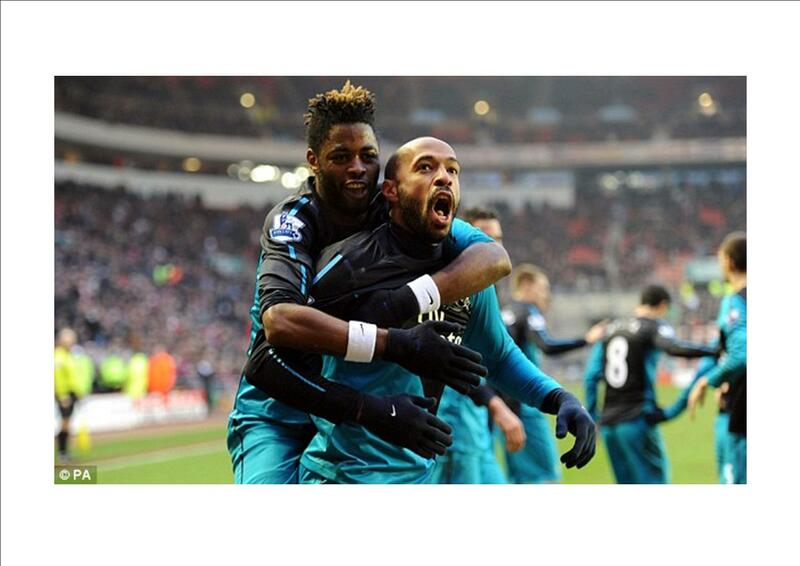 A few thoughts on the Sunderland 1 Arsenal 2 match We’re back in 4th. | "It's all about the Arsenal"
A few thoughts on the Sunderland 1 Arsenal 2 match We’re back in 4th. It is a big footie day today. Arsenal are playing away at Sunderland the in form team of the Premiership under new manager Martin O’Neill. Liverpool away at United and Newcastle away at Spurs. Arsenal need a win today. So it’s a freezing cold morning in Harlow when I get up and smell the bacon being cooked wafting up from the kitchen (Bacon’s Goooood) . Quick shower, change and it’s downstairs for the match day full English. Not in mood to do much today, so just chill around the house. 12.30 turn in the TV. Might as well watch the Mancs battle it out with the Scousers. Lots of focus on Evra and Suarez as they come face to face for the first time on the pitch since the affair all blew up and Suarez got banned. The teams lined up, would Suarez shake hands? As the teams went down the line it happened or rather it didn’t happen… This was like Christmas to Sky, they had a story and boy you could see this was going to run and run. The game was not that bad yet not the battle royal you’d come to expect when these two giants lock horns. One superb move where United’s two greats Scholes and Giggs combined and a Giggs cross was headed straight at Reina by Scholes, deserved to be a goal. That was about the highlight of first half 0-0. News then came in on SSN’s of a bundle down the tunnel, this was getting interesting. United came out for the second half all guns blazing and Rooney bagged a brace in the first four minutes of the half. 2-0 United. Bit of a mix up in United’s defence and Suarez of all people makes it 2-1 and this is how it ends. All that was left was for Geoff Shreeves to do a hatchet job on Kenny Dalglish and for Sky to ignore the match and focus on the handshake. Look forward to Handshake of the Day tonight. The teams are in……….. Szczesny, Sagna, Mertesacker (Ramsey 72), Vermaelen, Koscielny, Arteta, Song, Rosicky, Walcott (Arshavin 86), van Persie, Oxlade-Chamberlain (Henry 66). Subs not used: Fabianski, Gibbs, Benayoun, Coquelin. Looks as strong a side as we can get at moment. 3pm and time to tune into SSN’s and today I have to share the game with the Scouse legend Robbie Fowler who will keeping a watching eye on the Sunderland v Arsenal match. Also laptop at ready to check out my twitter time line feed. There really are some funny Gooners on my Twitter TL..
Game kicks off and Robbie is telling me Arsenal are on top and early pressure sees Arsenal win a corner. The Sunderland keeper deals with it comfortably and then this is followed by a RVP cross with is turned away as TV5 almost gets to the ball. The tide now seems to be turning after early Arsenal pressure that came to nothing with Sunderland now starting to take the game to Arsenal. A couple of quick Sunderland corners in succession, the closet ending with McLean just heading over the bar. Sunderland then grab another corner after the Campbells shot is deflected wide. Richardson becomes the first player into the ref’s book with a late tackle on Sagna. Then its Arsenals turn to go forward as RVP’s slide rule through ball sets up Walcott, he shoots hard across the face of the goal just past the far stick. I am not sure Robbie is enjoying this game, he looks bored 😦 . In a fluctuating game Arsenal are now on top with possession, probing, yet not making many chances. Sunderland seem to be taking particular care of Oxo and must be looking at him as our danger man. On 30 Song picks out Walcott with one if his trademark passes but Theo’s volley flies over the bar. On 39 the home fans rise as one to proclaim PENALTY REF!!! Mertesacker’s stoops low to chest the ball and the ball bounces up of the turf onto hand, penalty not given. Bleeding right too, if consistency in Arsenal’s matches is called for. Still I would not have been surprised if given, well done ref. This is followed by the home fans getting right out of their pram as Sagna blocks Campbell in the box… Same old Arsenal cheating again…. Same ol………………. 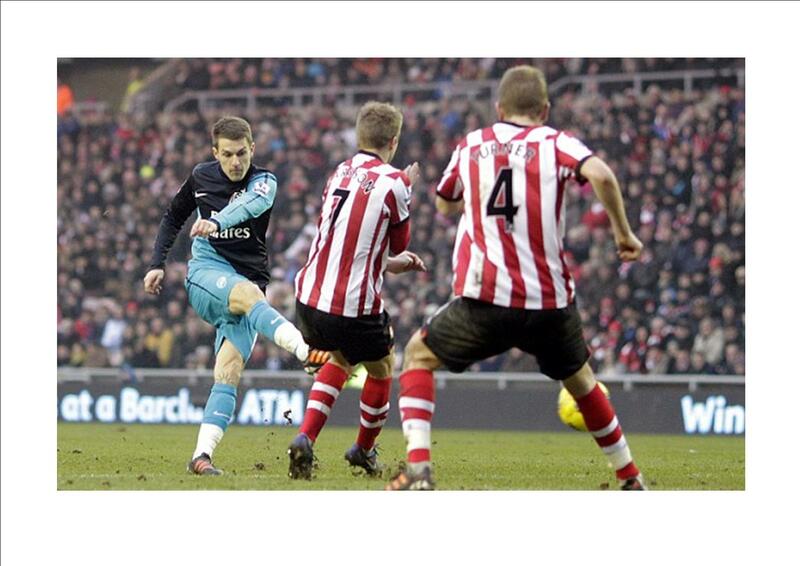 Free kick to Arsenal.. Arteta shoots… Shot blocked, familiar? A late corner from Sunderland that comes to nothing sums up the half. There is nothing in the game to write home about from the brave, hardly Arsenal away supporters in the Stadium of Light. I send a big shout to them. 70 mins DISASTER!!! Mertesacker with the ball seemingly under control just goes down as if shot by Sniper from the grassy knoll, thus allowing McClean through to shot low across the goal and past S13 to put Sunderland 1-0 up… Sod it… Mertesacker is carried from the pitch on stretcher and our injury worries raise their ugly head again. Ramsey comes on as a sub. This takes me and my 10 year Son into leaps of joy in the house. Get in there!! !”… 15 left. COME ON ARSENAL!!! TV5 fouls Campbell and Rosicky get booked for needlessly kicking the ball away. Arsenal are now in control of the match and looking for the winner. Walcott comes off and is replaced by the Meerkat. Sunderland make a change Ji Don-Won (no he didn’t) come on to replace Campbell. RVP heads straight at Mignolet, was that the last chance? Deux points down the pan. Four mins of added on time to be played… COYR’s… Pacing the room… Hoping to hear a shout from Robbie on SSN’s… Suddenly you hear it, the shout of the scouse accent… Geoff Stelling “and there’s been a goal at the Stadium of light” which was has it gone Robbie?… It seems to take an age and there is Robbie and to the left of him on the screen is the score Sunderland 1-2 Arsenal… Then Robbie explains about good work from sees Ramsey to TV5 out to the Meerkat and cross right to TH12 who sneaked in between two Sunderland defenders to volley into the net… No 229..
TH12 and Billabong Song celebrate the goal. I grab the boy, lift him and dance round the room in delight, the boys had done it. Th12 had done it… Arsene’s substitutes had done it… Did not even think about 3 mins left, just going Mental round the living room, where I suddenly felt the sharp pain in my foot where I had stubbed my foot on the sofa. “Ouch!! !” Maybe it was stronger words to that effect. I just thought took a blow for the team there. Then the SSN’s screen shows the players walking off shaking hands (who would think shaking hands could cause so much fuss) we had the three points and the hardy souls who had made the trip up north, would hopefully have a much warmer feeling inside for the journey back. The results are in…………………….. Chelsea had lost 2-0. Having seen Liverpool lose 2-1 at Man Utd earlier in the day, “The Arsenal” are now sitting in 4th place, happy sodding days and the ups and downs of the 2011-2012 season continue. Then to bed a Happy Gooner.